No digits were damaged that day at the feeding station . 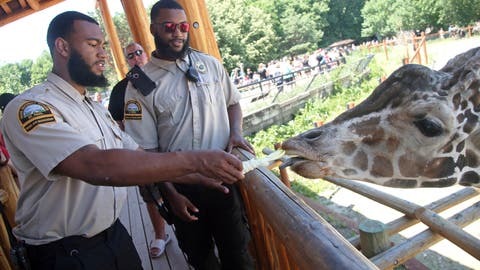 The interaction with the world’s tallest animal was merely another memorable and rewarding encounter on the job for these good friends and Gophers teammates who worked as security guards at the zoo before fall camp began. Gibson was locking up one evening when a gorilla startled him by throwing a branch at a nearby net, but otherwise the experience was all smiles and sunshine.